As I hinted at in the Hunt for the Red Solo, the hunt for the Trinidad and Tobago goat roti was a bit disappointing as well. Goat, by itself, requires a level of artisanship to properly prepare that so many have their own thoughts on. It’s dangerous territory to be critical of; some like it one way, some another and in a country doomed to 3-canal blades, guns and now grenades, you want to be careful how you criticize how someone makes a roti. The curry is open to more criticism, but not by much – what constitutes a good curry varies between parts of Trinidad like the color women dye their hair. I have a working hypothesis of where a woman is from in Trinidad based on the color of her hair. Start paying attention. The roti, itself, is more open to criticism without payback because there is little variance in what a good roti is. It is not dry. It is not scorched on the outside (well, dhal puri roti, anyway). 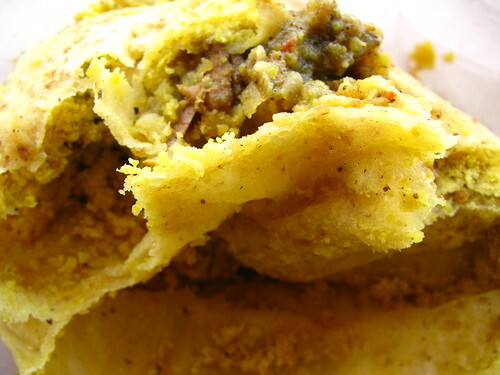 Yet after all of this – all these things that people might fight over – I have yet to hear a person say, “I would like the goat bones in the roti”, or, for that matter, “I want the chicken bones in the roti”. Why bones appear in a roti that so many people bite into with zest is a conspiracy that helps only those lazy enough to not remove the bones and dentists. Spread the word. “I don’t want bones in my roti!” And anyone that is dumb enough to want bones in their roti can have mine.